A truly remarkable free video editor that can deliver astonishing results in the right hands. You'll need to invest some time to get the most from it, but it's well worth the effort. Available for both Mac and Windows, HitFilm Express is a professional-level video editing tool without the professional-level price tag. 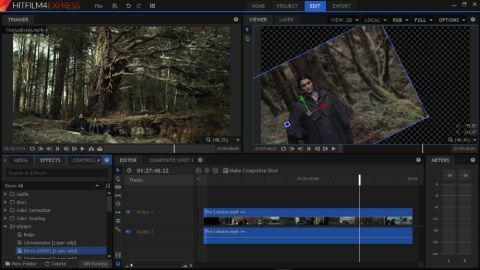 HitFilm Express is about more – much, much more – than just trimming away unwanted footage, tweaking colour levels, and exporting video to a new format. This is a full edit suite that can be used to work with filters and special effects, as well as a selection of 2D and 3D composition tools. While the emphasis of the program web site and tutorials is on creating Hollywood-style movies, it's also a great utility for vloggers – and YouTube uploading is built in. Getting hold of HitFilm Express is something of a palaver. You can’t just hit a link and download the software. Instead you have to take part in active promotion for the developer by sharing the fact that you're downloading it to social media. If you've used a video editor before, you'll find that there are few surprises when it comes to getting started with HitFilm Express. The interface is broadly similar to other comparable tools, with a central pool for imported material and a timeline to arrange it, but its unique feature set means it'll still be some time before you're able to get the most from it. If you feel lost, there are endless video tutorials to help you master HitFilm Express. However, you can also learn by experimenting with effects, dropping clips onto the timeline, and trying out the composition tools. The tools on offer are genuinely impressive, and include high-grade animation options that are simply not available free anywhere else. You can extend HitFilm Express with premium plugins as you become more familiar with its workflow and feel like branching out into new areas of editing. The latest version of HitFilm Express features Dolby Digital audio decoding support for AVCHD, major improvements to AVCHD decoding performance, and a new Derez effect. For a full list of all changes, see the official release notes.